Valentines Day is just around the corner. I finished this quilt just after Christmas but I have been saving this post for Valentines Day because it fits so well. I found this pattern in the November 2010 issue of American Patchwork magazine. I immediately tore out the pages and started my search for the fabrics they used. Sadly at that time the “Pink Chocolates” line of fabric was completely sold out everywhere! I couldn’t even find it on Etsy. Then in Phoenix at Christmas last year I found a fat quarter stack of pinks and browns that would work perfectly! I probably could have made two quilts out of the stack actually! 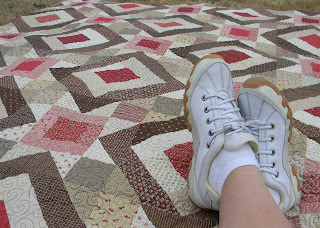 I started working on it at the Spring 2011 SMT quilting retreat and I finished it in November 2011 at the fall retreat. I love the way the star blocks and the log cabin blocks blend together to form this pattern. It’s like the dark brown squares are sort of floating in front of the light cream and pink stars. I used Shanna’s (Sweet and Sassy) idea of her wave quilting on a smaller scale. It like how it turned out but I think I will try it a bit looser next time. I made a label and attached it to the backing that I made out of minky! I love the minky backing? It makes the quilt supper comfy for cuddling. I finished the last of the hand stitching on the binding in the middle of January. Once again I used the scrappy reds for a binding. I love that look! 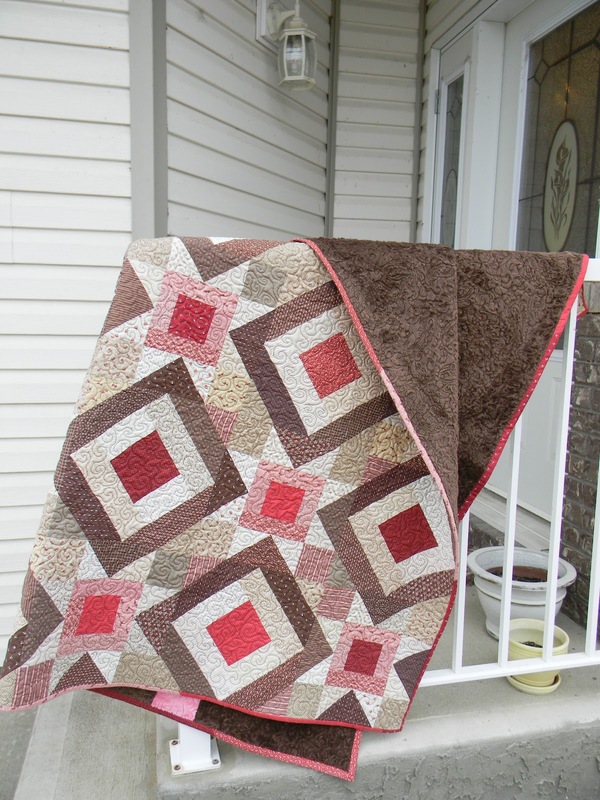 This quilt works perfectly with the color scheme of my living room as well. This quilt is all about me. I love the pinks and the browns, I love the minky backing, I love the name, Box of Chocolates! We have had such a mild winter here in Alberta this year so I was able to take all these photo’s outside. You may notice in this popular picture that I am wearing my new walking shoes for my upcoming trip to Israel! In the next few days you will notice some changes on my blog. 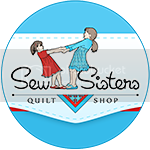 Not permanent changes, this will still be a quilting blog, but for my trip I plan to post daily updates of the places and people that I will be seeing. I hope that you follow along on my journey as I travel to the Holy Land to walk where Jesus walked! Fabulous Kerrie! I wonder if I still have that magazine hiding here. I love this quilt with its scrappy border! And its a great name too! Very pretty – love the pinks and browns!